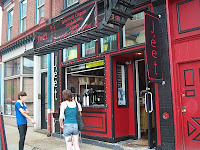 Needing a decent coffee stop on my way out one morning, I checked my coffee list for nearby coffeehouses and an intriguing place called J'eet showed up. I had not heard much of them except that they splendidly purvey Commonplace Coffee, a roaster of nearby Indiana (that at the time, was in the midst of setting up their own Pburgh cafe in Squirrel Hill). Always up for the adventure, I made my way through the AM congestion and found a parking spot right before the bright red-and-black, snack bar-esque front window of the cafe. Walking in, I was greeted by a cheerful barista sitting in a long shop that seems built for expediency (inside and outside serving windows) but also had a good amount of seating and a separate sandwich counter in the back. Said chipper spro slinger served me up a cup of Ethiopian (drip) and an espresso. The Ethiopian lent some flavors of bright blueberry, tart hyacinth, sunflower, a little grass and a bit of molasses (pretty good). The espresso, pulled short with fair crema, held bitter cocoa, lemon, sugar, some pepper and a little whiskey with a dark bite on the end (also pretty good). The tea I did not catch. 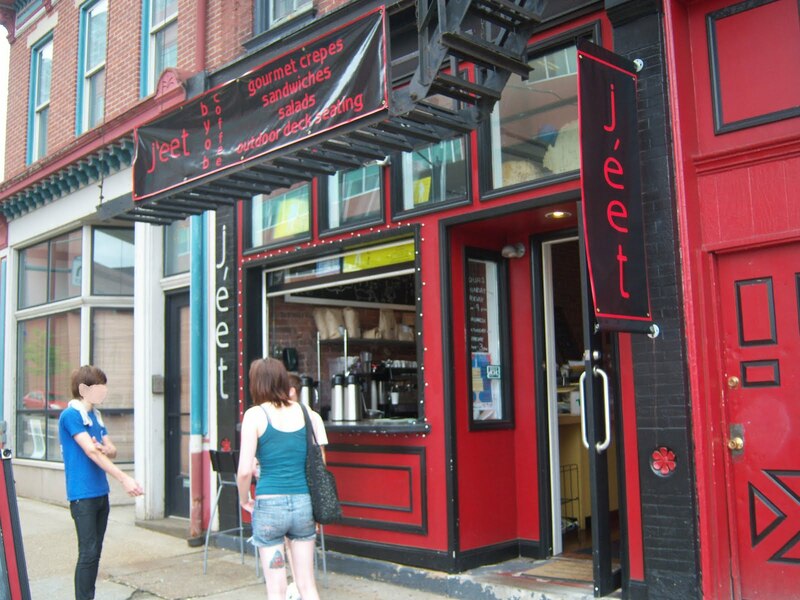 To encapsulate my endeavor, I would remark that J'eet not only peddles Commonplace Coffee well, but exists as a fine establishment in the neighborhood. Do make a visit. You gotta a love a good spot like that. For me it is Java Monkey in Decatur, GA. Great atmosphere and wonderful coffee. I just stumbled upon your blog. I noticed you visit coffee shops all over. Anything up here in Canada worth mentioning? Check out my index and map on the left side of the coffee. Been to a handful of places in Canada. They just got rid of their espresso and are carrying plain. drip. coffee. No reason to work in the area now.